There is nothing that shouts out autumn to me more than beetroot. You might have gathered by now I’m ever so slightly addicted to this perfectly purple vegetable and I reckon the best way to eat it is simply roasted, when it goes all sticky and sweetly caramelised. Just delicious. 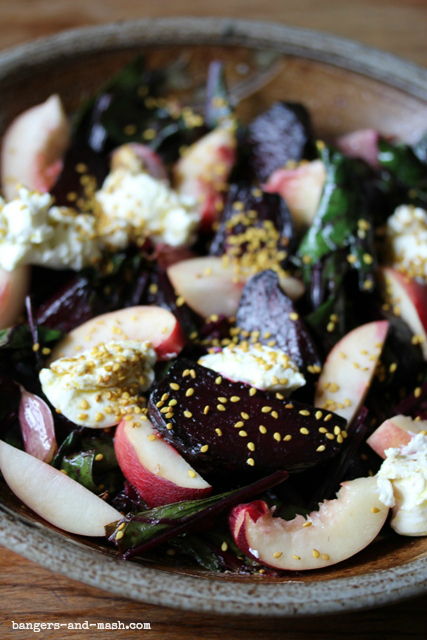 Roast beetroot is the predominant ingredient in this gloriously robust salad. It is inspired in part by a recipe by Tom Hunt’s from his brilliant cookbook The Natural Cook and also by a Riverford recipe which partners the roast beetroot with slices of nectarine, which is just the most brilliant pairing. This salad also makes the most of the beetroot tops. If your beetroot come with these attached, please don’t ever throw them away – they’re delicious. Serve them as a vegetable side; just saute them in a little olive oil for a couple of minutes with some chopped garlic. If you don’t have any, you can replace them in this salad with any leafy greens, such as spinach, pak choi or chard. 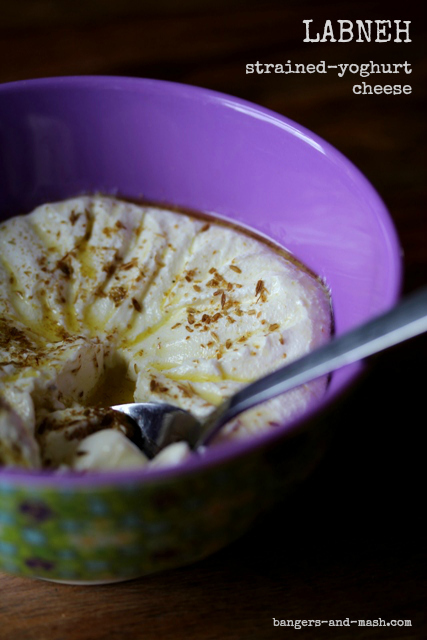 Hunt’s recipe calls for labneh, a simple soft cheese made from strained yoghurt. This was the first time I’ve made it myself and it’s really so very easy and so very satisfying to create your own cheese from scratch. And it tastes pretty darn good too. If you don’t fancy making your own, buy some or replace with the same quantity of thick full-fat yoghurt. Place the yoghurt in a piece of muslin or a tea towel. Tie with string to seal the cloth and place in a sieve. Suspend over a bowl overnight (or at least four hours) to allow the whey to drain away. Easy as. Remove the leaves from the beetroot and reserve. Wash the beetroot and cut into wedges around 3cm thick. Toss in olive oil and season. Place them in a baking tray and cover with foil. Bake in the oven for 30 minutes. Remove the foil and add the garlic cloves (still in their skins). Keep back one clove for later. Return to the oven for another 20 minutes until the beetroot is tender and slightly caramelised and the garlic is soft. Peel and thinly slice the remaining garlic clove. Saute the beetroot tops (or whatever greens you are using) in a glug of olive oil for a couple of minutes. Add the sliced garlic and a squeeze of lemon juice, and season. Season the labneh with a little lemon juice, 1 tsp of the lemon zest, a drizzle of extra virgin olive oil, cumin and salt and pepper. 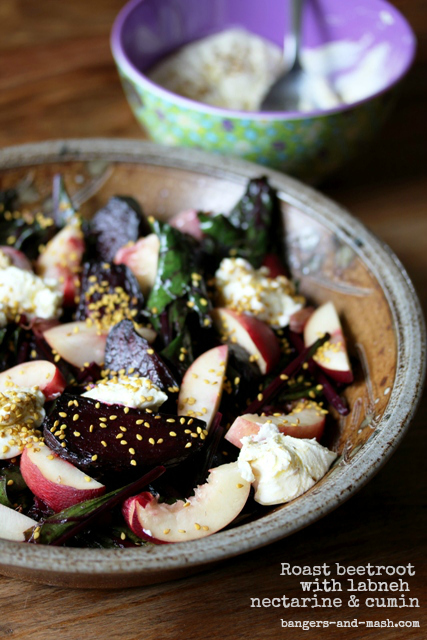 Combine the roast beetroot, garlic cloves, greens and nectarines and add the remaining lemon zest. Spoon into a large serving dish. Dot large spoonfuls of the labneh across the vegetables and sprinkle with sesame and cumin seeds. Serve as part of a mezze or on its own with lots of thick crusty bread. Sounds absolutely delicious, I love beetroot too – never tried the nectarine combo though. Oh you should try it – works so well! Yum! That looks utterly delicious, and I adore the pics. Ooh me too! What have you got? 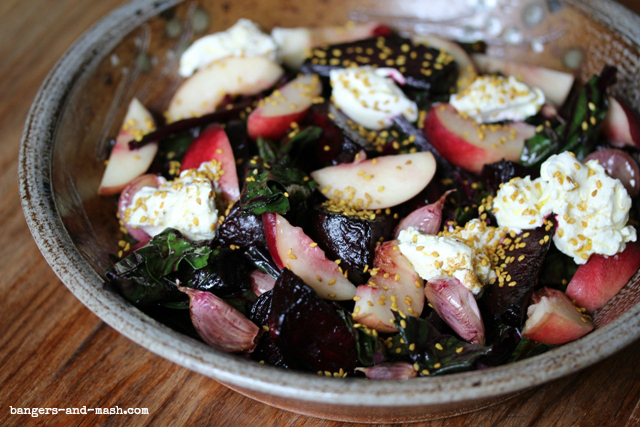 Gorgeous pics V. And I have decided I Iike beetroot as long as it is roasted and served with things like yummy labneh. This looks amazing, I’ve never tried adding nectarine to this kind of salad, must be delicious!